Upper: Mesh with high-density printing, plastic heel counter. Widths available: D - regular (reviewed), 2E - wide, 4E - extra wide in select colors. The Nimbus 19 is perhaps the firmest and tightest fitting Nimbus yet. Why? Because it's got a new Flytefoam midsole, and a heel design which pushes the foot forward inside the shoe. For the past seven years, buying a new Nimbus has proven to be the footwear version of playing Russian Roulette. One year the shoe is super-soft and roomy, and the next year it is unimaginably firm and tight. We’ve seen this happen from the firm Nimbus 14 to the very soft 15; then the just-right Nimbus 16 to the unbelievably squishy Nimbus 17. The last year’s Nimbus 18 then turned much firmer and tighter than the 17. The Nimbus’s update pattern so far was firm-soft-firm-soft, but this year that pattern is broken. For the Nimbus 19 arrives with a firmer ride and narrower fit than the 18. 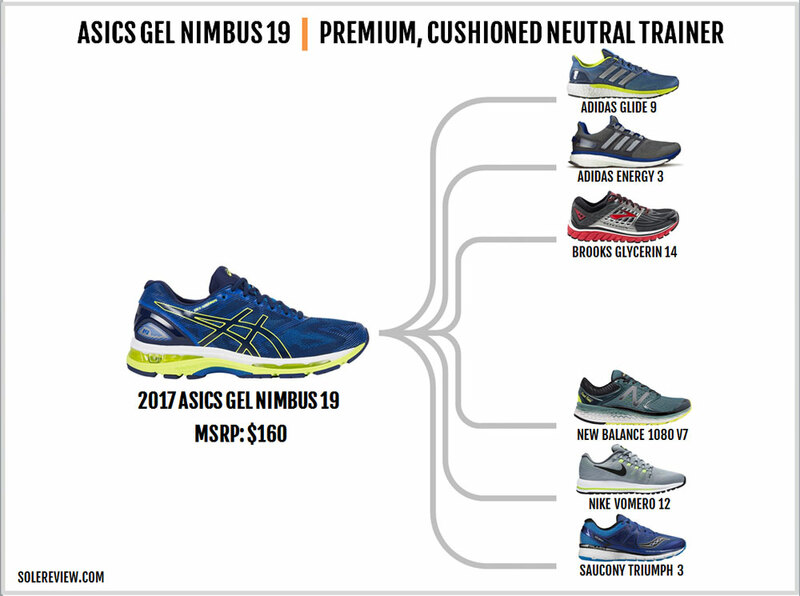 Considering that the Nimbus has been around for nearly two decades, most runners know that this shoe is supposed to be Asics’s premium neutral cushioning shoe. Positioned above the $40 cheaper Cumulus, it has been the go-to shoe for most who seek a plush running experience. At least that’s the basic idea behind the Nimbus. 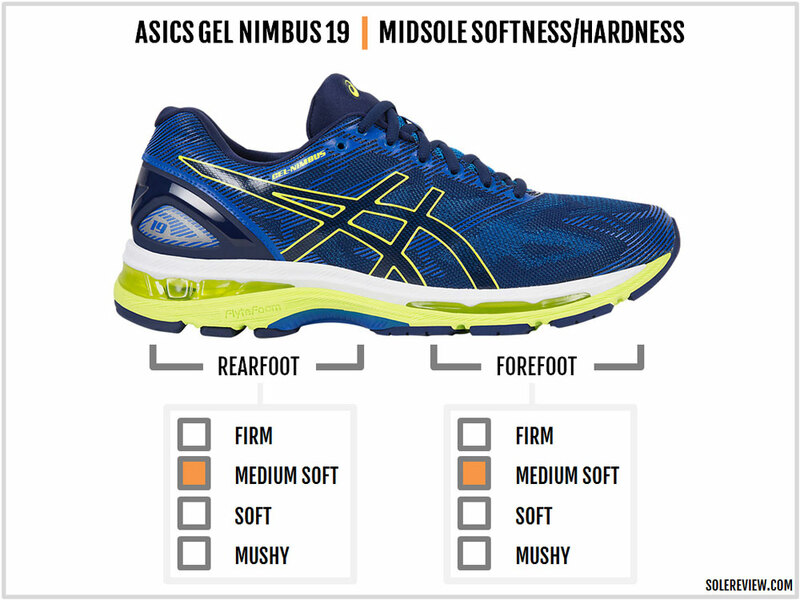 Except that Asics is fickle-minded in its design approach towards the Nimbus. Is it supposed to be a very soft riding shoe, or a firm one? Is the upper supposed to be relaxed in character, or narrow like a fast-training shoe? Nimbus loyalists are still trying to wrap their heads around this, and what’s worrying is that Asics doesn’t seem to have a clue either. The Nimbus 19 features a Flytefoam based midsole which makes the ride firmer, and the upper changes reduce forefoot and toe-box space. This is saying a lot because you know how the Nimbus 18 was already a firmer and narrower version of the 17. The Nimbus 19 goes a step further in both these aspects. There are visible changes on the Nimbus 19’s upper over the last year’s model. But if you look past the cosmetics, then the basic design template stays the same. The upper is constructed using a single piece of Jacquard mesh; you can also call this an engineered mesh as there are areas of varying weave densities. On the sides (near the midsole edge), the mesh has a tighter weave while it is relatively open over the forefoot. Most of the upper has no external layering. Instead, Asics uses high-density printing over the mesh which gives the shoe its aesthetic depth.The Asics logo is printed flat over the midfoot on both sides. The heel has a lot of structure. There’s a solid piece of molded plastic on the outside, and this clip wraps around the forefoot. The Nimbus 18 had this too, except that the reworked counter on the 19 is longer on the sides. Windows molded into the sides expose reflective elements which do a fine job under low-light conditions. 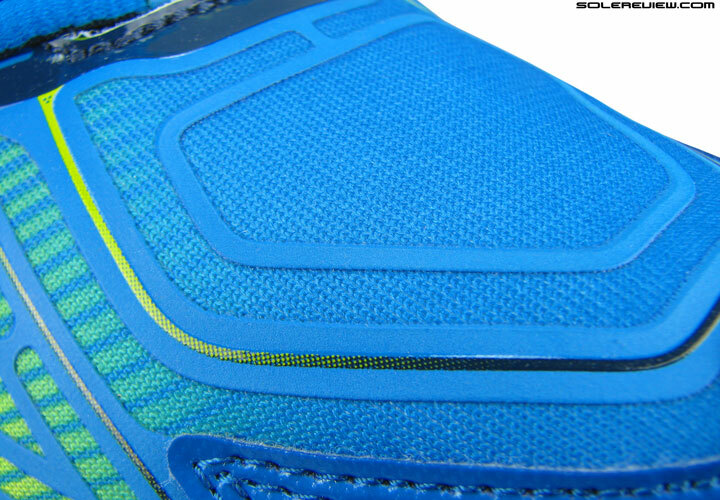 Inside the heel, the mesh lining and the volume of foam quilting has been updated. The collar is plumper than the Nimbus 18, and the mesh is also softer. This new heel design grips the foot with a more secure hold than the Nimbus 18. The new heel material and treatment bears an uncanny resemblance to the Brooks Glycerin 13 and 14. It even feels the same; did someone switch camp from the Brooks design team to Asics recently? Not only that, Asics says that it uses ‘3D printed layers’ over its upper, which is similar to Brooks’ ‘3D Fit Print’ claim. The tongue also uses the same soft material as the heel, and as always, it comes without a sleeve. As with most Asics shoes, tongue slide will occur during runs. The laces are soft and slightly stretchy, and pass smoothly through the integrated metal eyelets. There are no seams inside the upper, so the interiors feel connected and friction-free. The midsole receives a major update – not in the form of aesthetic design but in material. The Nimbus 19 has two different foam densities stacked together, except that the lower part is made of the firmer Flytefoam. Asics’ new material feels like EVA foam but a firmer kind with a fibrous texture. 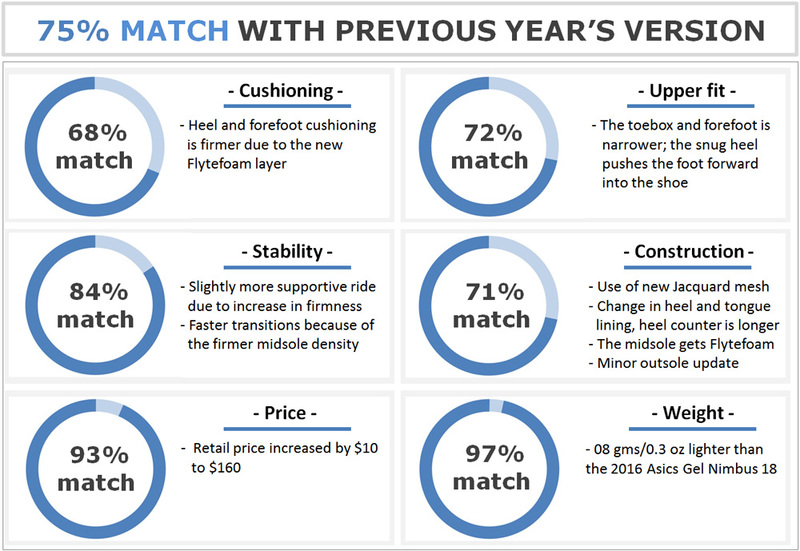 Which makes sense; Asics states that the foam is blended with ‘natural fibers.’ The Flytefoam material is a trickle-down from the expensive Metarun, and is now found on the Kayano 23, Nimbus 19 and the Dynaflyte. The portion of the midsole just below the upper is still standard EVA, and softer than the Flytefoam variant. 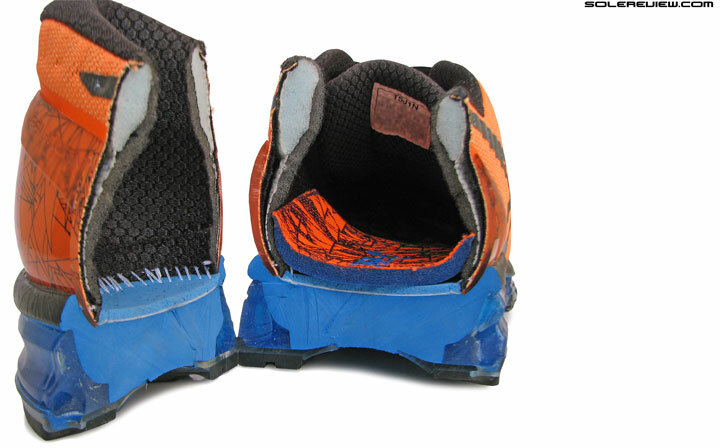 Additional layers lie atop the midsole; there’s a removable Ortholite insole made of blown foam, and an even softer sheet of lasting below it. The design of the insole stays the same, except that the fabric used on its top is softer than the Nimbus 18. Again, the nappy insole fabric feels inspired by the Brooks Glycerin. Asics points out that the Nimbus 19 has ‘gender specific cushioning.’ This means that the cushioning level of the women’s Nimbus 18 is slightly different than the men’s model. Not only is the upper section of the midsole softer, but the shoe has a higher heel drop of 13 mm vs. 10 mm on the men’s model. Naturally, the stack heights are different too. The rearfoot is 25 mm thick on the women’s Nimbus, compared to 23 mm on the men’s model. The forefoot is thinner by a millimeter on the women’s Nimbus 19, which results in the 13 mm heel-to-toe gradient. The outsole is redesigned for 2017, but the layout stays the same. All the components are in the same place where the N-18 left them. There are multiple hard rubber pieces mounted under rearfoot, followed by a two-piece plastic shank and then multiple pieces of soft blown rubber under the forefoot. The Nimbus is moderately flexible due to the generous grooving separating the rubber lugs. The familiar Guidance line splits the outsole into two halves. 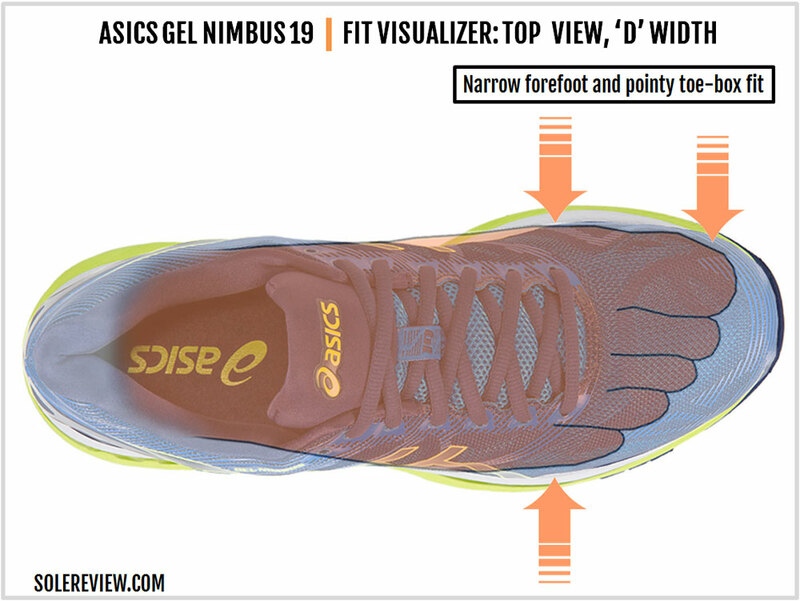 There are two sandwiched Gel windows under the rear and forefoot, and these get a cosmetic redesign for the N-19. 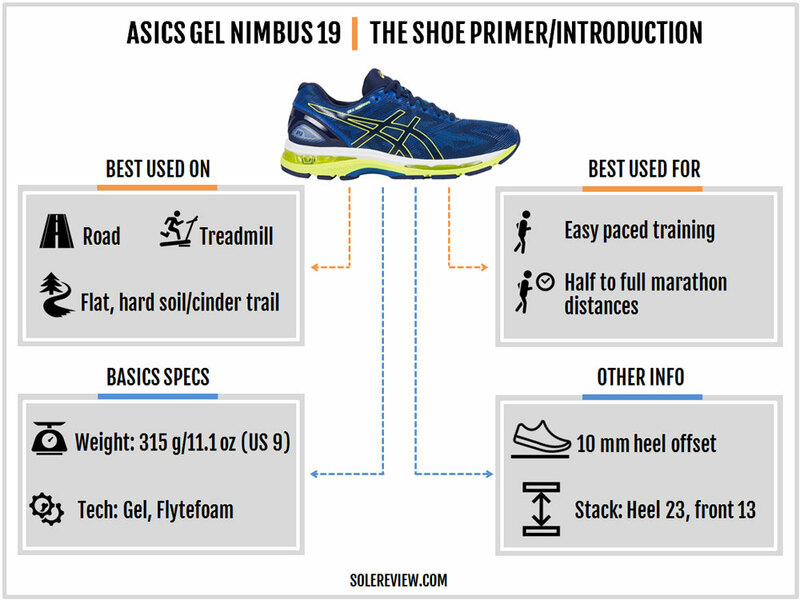 In the overall scheme of things, the Gel is not a major contributor to the Nimbus’ cushioning. 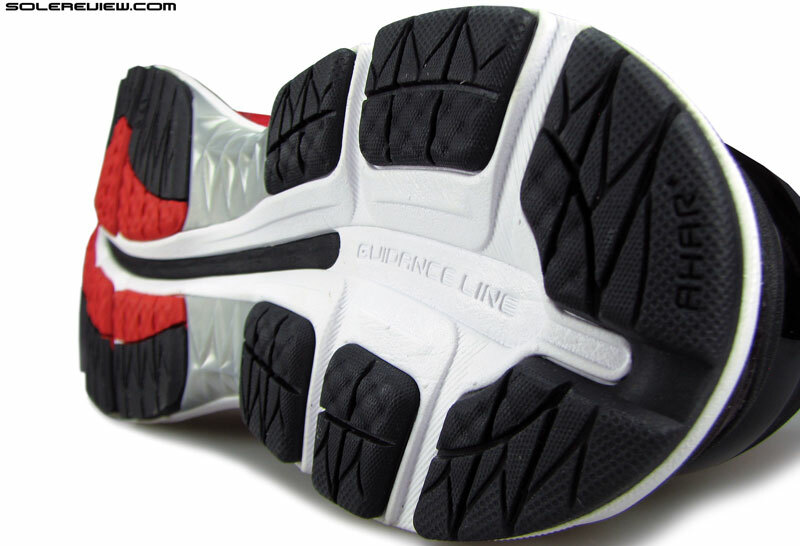 The Gel is limited only to the sides, and the amount of actual Gel inside the midsole is very tiny. The Nimbus 19 shouldn’t give you any trouble as far as durability is concerned. The midsole foam is susceptible to a cushioning loss over time, but the firmer build (Flytefoam) this year should slow down that process. The outsole is softer under the forefoot, so expect that part to experience wear and tear before the harder (and more durable) forefoot. The upper is well stitched together with quality materials, so it should outlive the midsole and outsole. Isn’t that what happens with most shoes? Let’s start with the rear because that’s what affects the rest of the Nimbus 19’s upper fit. The new collar lining is filled with a lot more foam than last year, resulting in a plumper fit. The plastic heel counter is also longer on the sides, hence turning the heel fit narrower. The upside in heel plumpness pushes the foot forward into the shoe, which causes the toe-box to feel shallow. We thought that the Nimbus 18 already did that, but what do you know. If it’s any consolation, the interiors feel smooth due to the absence of seams. The tongue is soft to the touch and filled with foam, but it slides to one side due to the lack of an inner sleeve. The same redesigned heel which makes the toe-box shallow also makes it pointy, and the forefoot narrow. 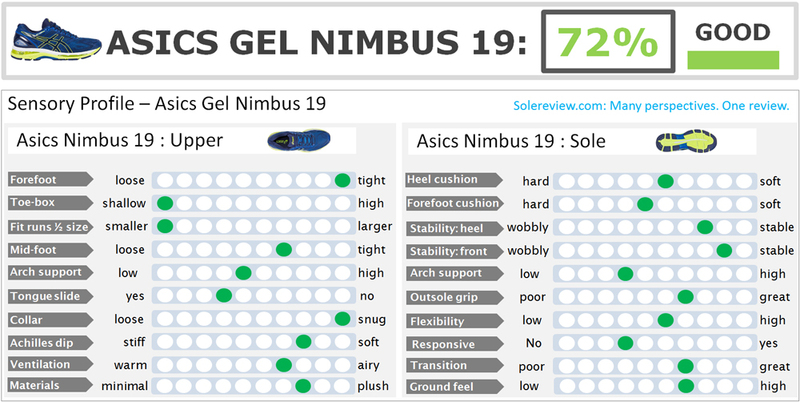 We don’t believe that the actual shape of the Nimbus 19’s forefoot and toe-box has changed when compared to the Nimbus 18. Sure, the Jacquard mesh upper is denser near the midsole edges and feels less accommodating than the Nimbus 18’s mesh, but that does not appear to be the primary reason behind the reduction in interior space. You see, when the foot is pushed forward by the plumper heel area, it moves towards the narrower end of the shoe. So even with all things being equal, the fit feels noticeably narrower than before. The increased tightness is felt more on the outer side (over the small toes) than the inner (big toe) side. We’ve seen this play out in so many shoes over the past few years, where a reworked heel moved the foot’s position forward – leading to a Domino effect of upper fit. This change means that you’d probably need to buy a half size larger than the Nimbus 18, though some of the runners could do with the same size. But if you’re transitioning from the Nimbus 16 or the 17, you definitely need to go a half-size up. The new shoe isn’t the Nimbus most have grown up with. It is perhaps the firmest Nimbus of all time, and this has a lot to do with the introduction of the firm Flytefoam material used in the shoe’s midsole. Whatever cushioning softness is available comes from four things, all concentrated closer to the foot. 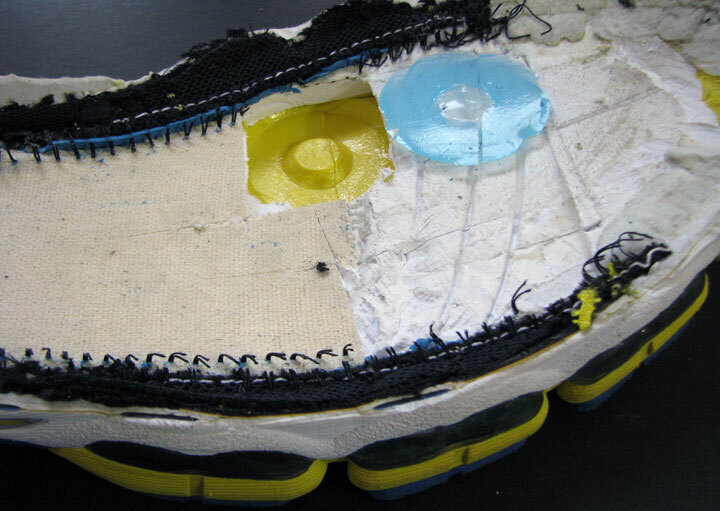 At the very top is the removable insole made of soft foam, followed by another layer of blown foam below. The visible Asics Gel windows also help increase softness on the outer midsole, and the cavity under the heel also aids midsole compression. 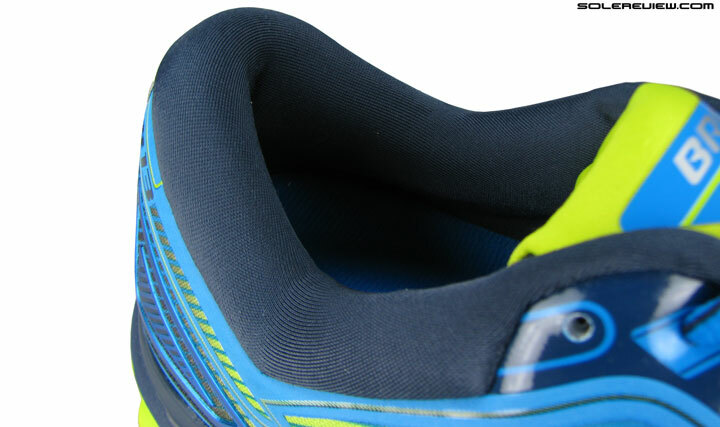 The heel crash pad is also separated from the rest of the outsole by a deep groove, so it flexes outwards during footstrike and adds to the cushioning sensation. 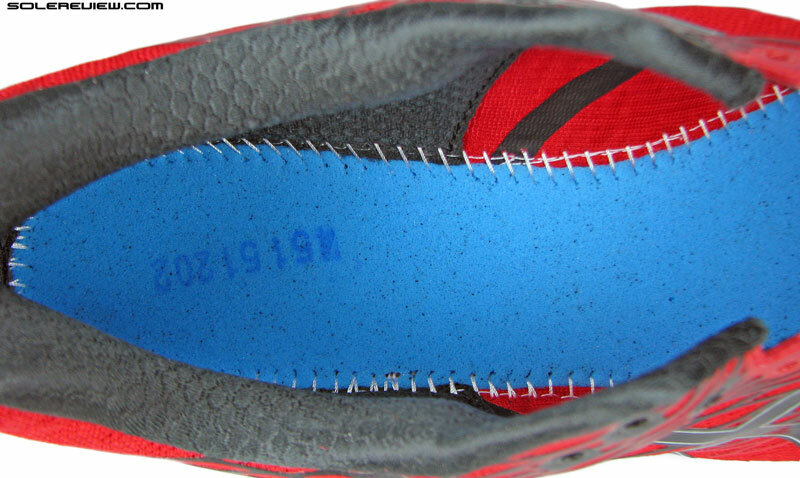 And you should know that most of the midsole cushioning comes from the foam and not the Gel pads. 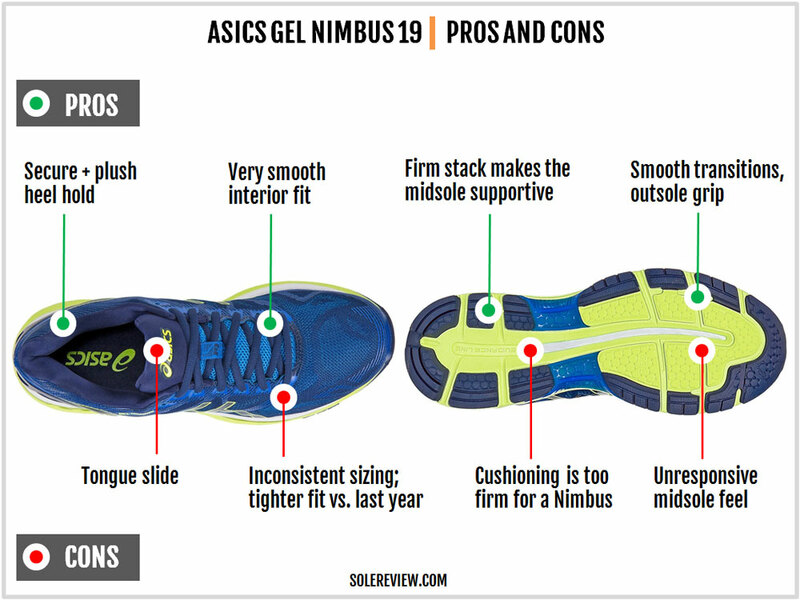 We have demonstrated in the past how the small the Gel pads are inside the shoe; the Nimbus 19 has a similar placement of Gel inside. 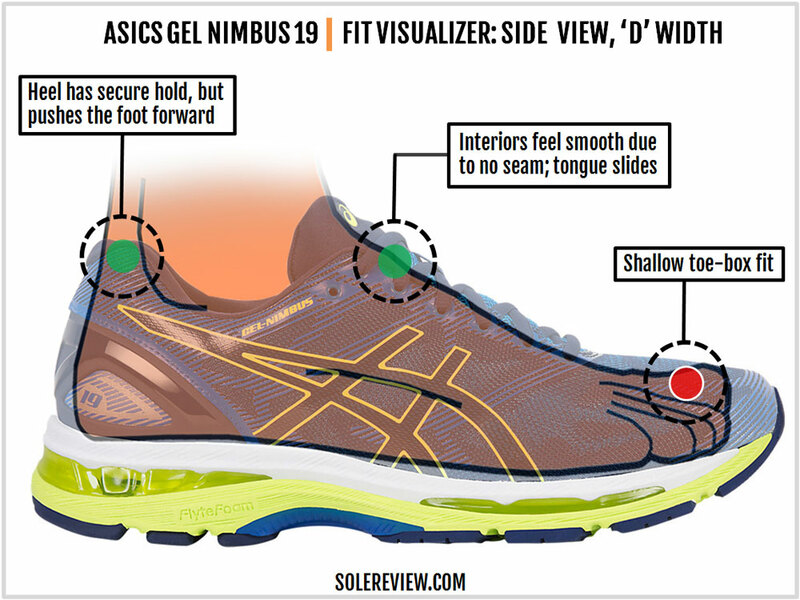 See-thru Gel windows on Asics midsoles are exactly that – window dressing. The women’s Nimbus 19 is softer than the men’s model. The upper midsole layer (above the Gel) has a softer density than the men’s Nimbus, and the stack heights are thicker too. This raises the women’s Nimbus 19’s heel-to-toe gradient by 3 millimeters to 13 mm, versus the men’s 10 mm. Very few Nimbus shoes are responsive in the true sense of that word. The running shoe landscape has changed quickly over the past few years, and newer midsole materials have given new meaning to the term ‘responsive.’ Midsole foam like the adidas Boost and Saucony Everun harmoniously meld cushioning softness and bouncy-ness. Asics tries hard to keep up. The Nimbus 19’s switch to a Flytefoam base makes it more responsive than the previous models. Please understand, though, that our use of the word responsive is contextually limited to Asics. If you’re used to other running shoes from adidas, Nike or Saucony, then the Nimbus is nowhere close. But when compared to the Nimbus 17 and 18, the N-19 delivers a minor amount of spring-back. Most of this is delivered by the cavity under the heel area. When weight is applied on the rearfoot, there’s a ‘trampoline effect’ coming from the firm midsole splaying downwards, and this gives the Nimbus its small degree of responsiveness. The outer midsole is softer than the inner side due to the large Gel window, so the softness is biased towards the lateral side. This happens in many neutral shoes, so there’s nothing to worry about. Also, it’s worth noting that the firmer midsole makes the new Nimbus more supportive than the 18. The Nimbus 19 might have lost the soft cushioning feel of older models, but there’s a silver lining to all this. With a firmer ride comes better transitions; remember the trade-off of the super-soft Nimbus 17 where the ride felt slow and swampy? Well, the opposite happens here. A firmer midsole equates into smoother progressions over the midsole, and also creates the right environment for the Guidance line to perform. The groove running through the center of the outsole keeps the foot centered, and the forefoot lugs also don’t get in the way as much they did before. 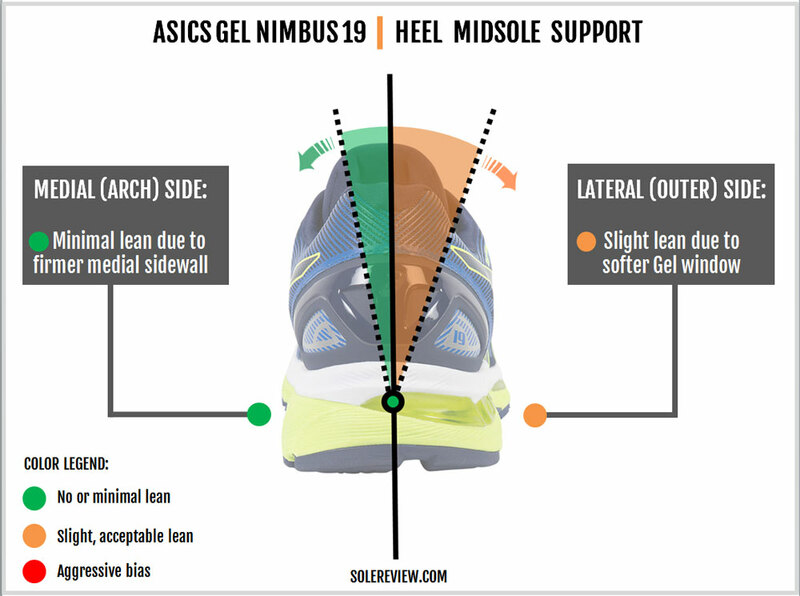 However, runners who are new to Asics might find the Guidance line infused forefoot to be lumpy. So whatever it’s worth, the Nimbus 19 is one of the fastest Nimbus versions ever. The past few Nimbus versions have moved to a seamless upper platform, which has resulted in a smoother interior environment. That applies to the Nimbus 19 as well, and that’s a good thing. Also, the materials feel plush – for example, the heel and tongue feel soft and smooth to the touch. There are some nice extras too, such as the abundance of reflective trim on the heel. You might not get the soft plushness of historical Nimbus models, but the higher firmness of the midsole makes the Nimbus faster (who’d have thought?). Transitions are better on the Nimbus 19, and the midsole offers increased responsiveness too. Despite the noticeable drop in softness, there’s no dearth of cushioning. A thick stack of dual-density midsole foam provides sufficient damping protection from the harshness of the road, and the soft insole delivers an effective first layer of cushioning. All this is good, but when a runner buys a Nimbus, they do so for the plush ride character. Sadly, this is sorely missed on the Nimbus 19. The new Nimbus is a firm Nimbus, and vaguely reminiscent of the last firm Nimbus – the version 14. The Nimbus 19 goes $10 up over the Nimbus 18. An MSRP of $160 is very expensive, considering that there are other examples of plush cushioning to be had for $20 to $30 less. Our pet peeve with the N-19 is its sizing inconsistency. Changes made to the heel pushes the footwear forward, hence making the forefoot narrower and the toe-box pointier than both the Nimbus 17 and 18. Irregular sizing behavior with successive model updates makes the buying process highly unpredictable and unsatisfactory for runners. Even with all the changes made to the materials and the midsole ride, sizing is supposed to be the untouchable constant. Much water has flown under the bridge since the Nimbus 18. The latest version is firmer due to the reworked midsole, and the upper fits tighter due to the changes made to the heel. The heel is molded narrower, and there’s a lot more foam packed behind the mesh lining. At an overall aesthetic level, there isn’t a lot of change. The upper keeps the one-piece upper and external heel counter design seen on the N-18, except that the mesh is a Jacquard type with varying weave densities. The printing over the mesh is new, and the stacking of foam-Gel-foam is similar to the Nimbus 18. The Nimbus 19 is 08 grams/0.3 ounces lighter than the 18 due to the midsole update. This isn’t something you’ll notice during runs, but the shoe is lighter at a basic spec level. 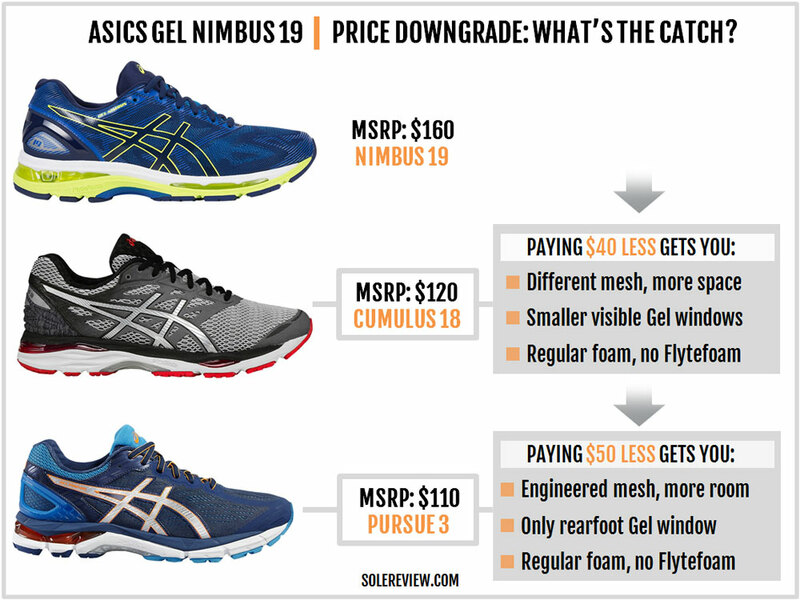 While the weight comes down, the price goes up – the Nimbus 19 now retails at $160, making it one of most expensive shoes within the premium neutral cushioning assortment. So what if you liked neither the Nimbus 18 or the 19? Let’s say you didn’t like the Nimbus 18 and were waiting for the Nimbus 19 to return to its softer roots. That hasn’t happened, so what are your options? An obvious purchase decision would be to scout for pairs of the mushy 17 or even get the slightly softer 18. 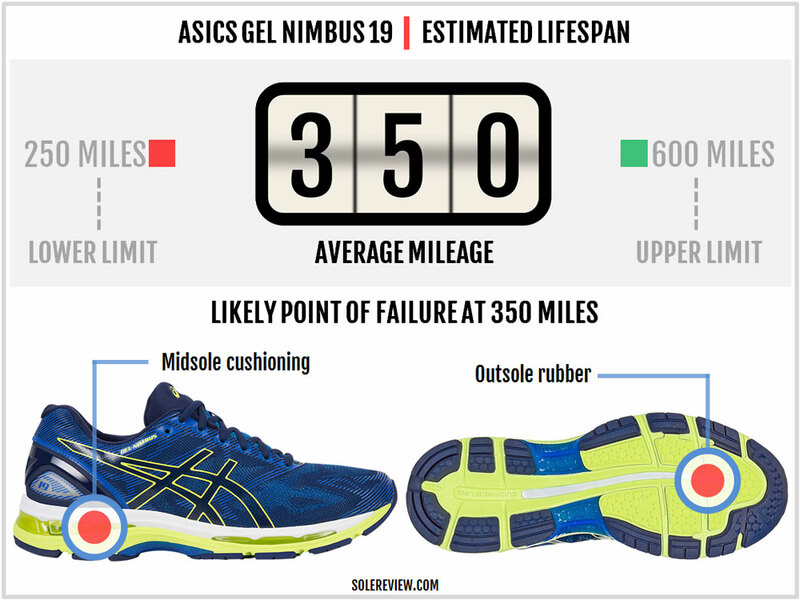 If neither appeals to you, then try the little-known ’Nimbus hack.’ Asics currently sells a shoe called the Gel Evate 3 which uses the Nimbus 15 outsole. The N-15 was super cushioned, but not mushy like the 17. 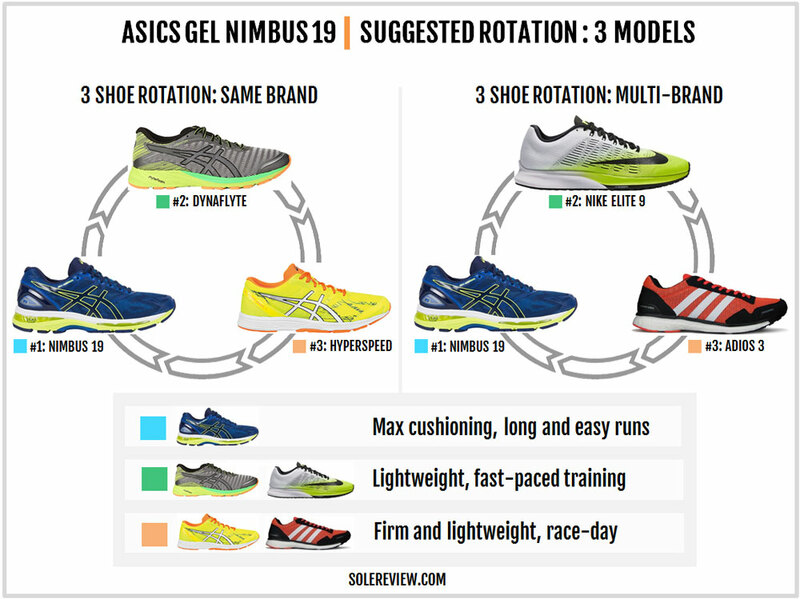 So buy the Gel Evate 3 if you seek the traditional Nimbus experience which is missing on the Nimbus 18 and 19. Technically, there are two higher-priced neutral running shoes above the Nimbus 19. One is the obscenely priced Metarun at $250. The other is Gel-on-the-outside, foam-on-the-inside Quantum 360 at an MSRP of $170. But if we adopt that tiering structure, then the Nimbus will be the ‘cheapest shoe’ at $160, which makes no sense at all. So let’s take a different approach which places the Nimbus at the top, and cheaper models below. As you’ll agree, this approach is more palatable to everyone’s frugal tastes. For $40 less, the Cumulus 18 offers a similar ride to the Nimbus. The difference lies in its slightly lower material spec; the upper feels less plush than the Nimbus. But you know what? The difference in ride quality doesn’t justify the $40 price gap, and the upper has more room than the Nimby. Perhaps it won’t be a bad idea to buy the Cumulus 18 instead after all. Oh, by the way, the Cumulus and Nimbus are evenly matched on weight and heel-offset. Below the Cumulus is the Gel Pursue 3. There isn’t a lot of difference between the Cumulus and Pursue, except that the latter has a rearfoot-only Gel window and a different upper design. 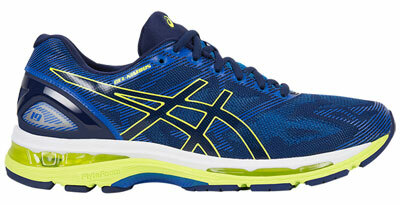 If a training shoe for faster running is what you want, consider the Asics Dynaflyte. Its Flytefoam midsole material is similar to what’s used on the Nimbus, and the overall firmness makes for quicker transitions. 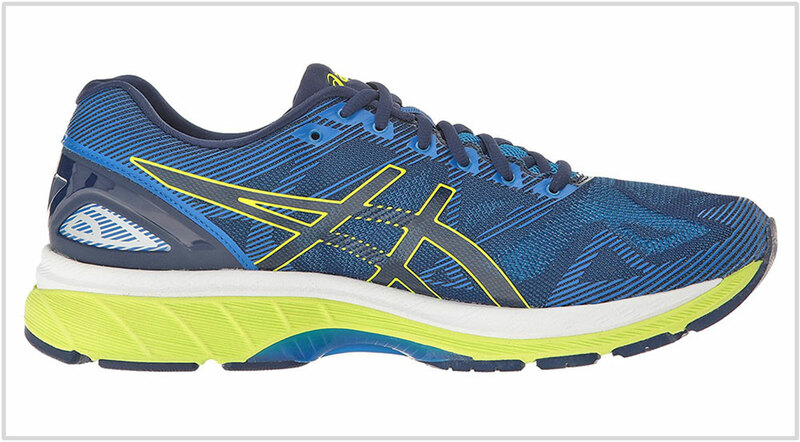 For race-day use, the Hyperspeed 7 is Asics’s popular racing shoe. The newly introduced Nike Elite 9 is an excellent choice for fast training runs. The combination of a lightweight build and cushioned midsole makes the Elite the perfect middle-ground between a full-blown neutral trainer and a minimalist racing shoe. We often recommend the adidas adios 3 as a racing shoe companion, and with good reason. The breathable and lightweight upper disappears on the foot during runs, and the Boost infused midsole contributes much-needed cushioning over longer distances. Besides the Nimbus 19, there are many others in the top-tier premium neutral cushioning category. The recently softened Supernova Glide 9 is the new cushioned ideal within adidas’s neutral assortment; the large Boost midsole brings with it the signature sensation of bouncy softness. The alternative would be the adidas Energy Boost 3, which also has a sizable Boost midsole. The Nike Vomero 12’s midsole cushioning is powered by two Zoom Air bags encased within a softer Lunarlon core. Even though the 12 is firmer than the 11, the Vomero is softer than the Nimbus with more room inside the upper. An interesting comparison would be the Brooks Glycerin 14 because the Nimbus appears to be partly inspired by it. The Glycerin has a medium-soft ride similar to the Nimbus, and parts like the heel interior design and printed overlays feel uncannily similar at a conceptual level. The New Balance 1080 V7 is a relatively simple affair. A single-density foam midsole is attached to an engineered mesh upper, and the result is an unremarkable ride experience. The ride is well padded, but does not feel special in any way. 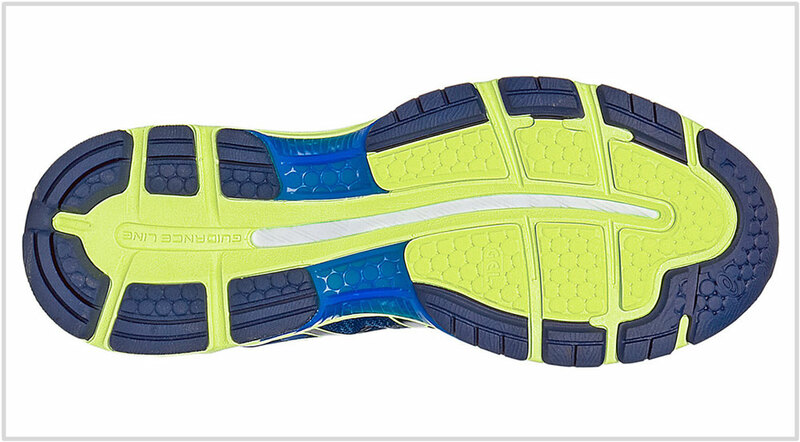 Lastly, the Saucony Triumph ISO 3 is a firm yet responsive neutral cushioning shoe. 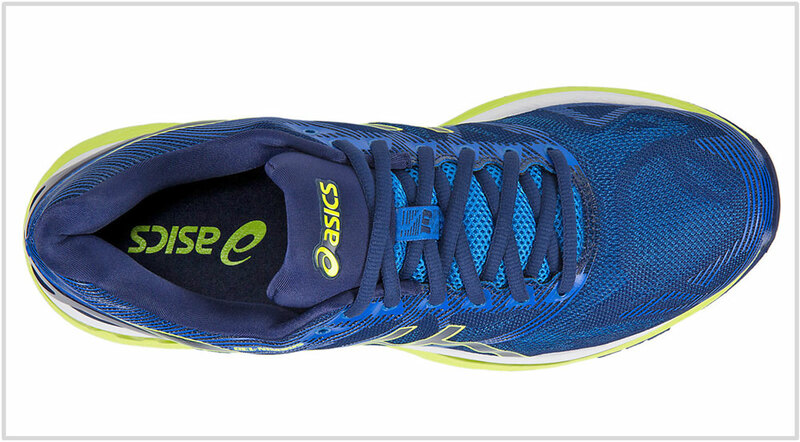 Its heel Everun insert makes the ride rearfoot-biased, and the firm midsole casing makes the ride firm and supportive. Out of all these, the Brooks Glycerin 14 is the closest match. Its midsole ride isn’t overly soft, and the upper has aesthetic and structural elements similar to the Nimbus. The Glycerin 14 has more interior room than the Nimbus, though.